The authors explore the association between evidence use and policy network structure in Burkina Faso and suggest that heterogenous networks comprising different actors and organizations are likely to increase the use of evidence and policy innovation. A short article describing how USAID used geospatial data to understand the impact of a $900 million investment in rural infrastructure in the West Bank/Gaza. The evaluation team found strong evidence that local economic output, as measured by remotely sensed nighttime light intensity, increased as a result of the rural infrastructure program. The authors highlight GIEs as a promising approach for rigorously evaluating programs in fragile states where the collection of baseline and endline data is challenging and costly. The authors – a researcher and policymaker team – conducted a reflective analysis of a major change in health financing policy in Burkina Faso between 2008 and 2018, which they supported in their respective roles. They share practical lessons for strengthening evidence-informed decision making, including the importance of: persistent and consistent production of rigorous and useful knowledge; fostering early interaction and engagement between the research and decision making communities; understanding the political and socio-economic context in which decisions are made; and seizing windows of opportunity for change. The authors make a compelling case for policymakers to invest in data that help inform critical decisions like where to build schools or direct medical resources, and to make that data publicly accessible so that communities and social entrepreneurs can help identify solutions that work. “Policymaking without high-quality public data is governing by guesswork,” they write. The authors describe their research to understand the contribution of the Network of African Parliamentary Committees on Health (NEAPACOH) to the evidence ecosystem in African parliaments. Annual network meetings serve as a platform for sharing evidence and building demand and capacity for increased use, strengthening partnerships between MPs and researchers, as well as creating a sense of accountability and competition for following through on commitments made each year. An additional key insight from their research is the importance of creating a mechanism for sharing forward commitments made at annually held regional workshops with national parliaments to make better progress in realizing them. How are public sector officials incentivized to use evidence routinely in their work, whether to inform major policies and decisions, design or alter programs, or guide implementation? 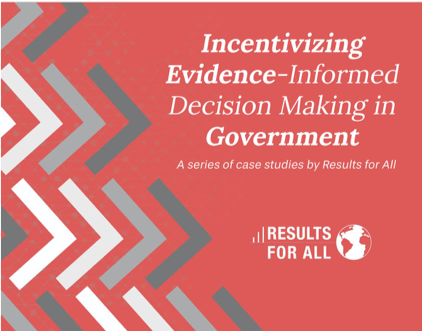 Our new series highlights strategies that government agencies around the world have used to create incentives for using evidence in decision making. Take a look at our first five case studies from Mexico, Sierra Leone, and South Africa! Do you have comments, questions, or ideas for us? We always love hearing from you! Contact us at info@results4all.org anytime.